This model generates a block signal that alternates between 0 and 1. The mean time interval of a section is given by the parameter meanTimeInterval. The distribution of the time interval is uniform between [0, 2*meanTimeInterval]. With the parameter random seed you can choose to make the distribution variable or fixed for each simulation run. 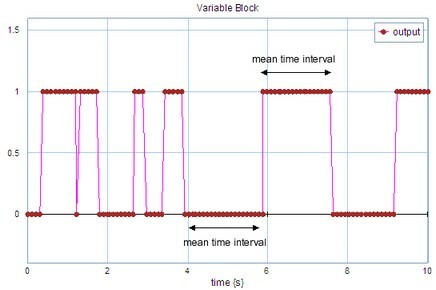 VariableBlock output with a mean time interval of 1 s.